mArlo, my mid-size Arlo robot platform, is complete and running as of today - Memorial Day, May28, 2018. mArlo uses the components of the Parallax Arlo Complete Robot System in more compact configuration - just under 12" in diameter. Many of my parts are from previous versions of the current Arlo. 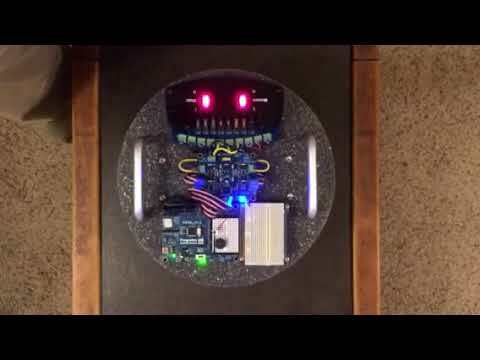 Below are build photos of the final assembly and a quickly shot video of the mArlo running some BlocklyProp Code written for the Arlo using Ping))) ultrasonic detectors for obstacle avoidance. It is called Arlo Roaming with Ping))) Obstacle Detection. The code is at this link - http://blockly.parallax.com/blockly/editor/blocklyc.jsp?project=15424 Notice the addition of an additional breadboard area in the final photo. Very cool, Whit! Thanks for sharing. Man! You've got some serious battery power on that thing! BTW, I like the photos from your shop. Can you show us around some more, please? Super-sized the power system because this will be the robot that collects the church offertory. @Phil Pilgrim (PhiPi) - this shop is my Dad's - really nice - well organized! Will post photo next time I'm there. @Ken Gracey - You got that right! Set up with two SLA batteries, mArlo weieghs about the same amount as Aron, but because of its size - it feels much heavier! If I didn't know better I'd say you cut up the counter top from your kitchen. Now *that* is dedication to robotics! I have seen threads about issues with the Arlo motors recently. Are you having issues with encoder failure and axle rubbing, too? Or maybe that may just be due to the large size robot, yours is a lot smaller by comparison. @GordonMcComb - Thanks - cutting boards were cheap, easy to find, and tough - the closest thing I could find locally to Arlo’s platform material - screws self-tap too! @AwesomeCronk- No issues here - and these are the very first 12V motor and wheel sets Parallax sold - long faithful service. Great job, Whit! Certainly makes for a memorable Memorial Day! Whit, While on the subject of the base, inquiring minds want to know how you cut it out. Or did it already come in pretty circles? There's some mighty fine chamfering on those edges. Almost like you have the right tool for the right job. That is a terrific idea for a bot platform, going to have to hunt down a few for my Slammer project. My plywood is starting to get a little weak from all the holes I drilled. Would you happen to know what kind of material yours is? Did it require any special tools for cutting? @Hal Albach - My prototype was cut using a bandsaw - drilled a center hole, made a pivot and spun the board to make the circles - then cut the wheel notches on the middle platform, the bottom is just a rectangle. Once I had everything figured out - I used a CNC router to cut the final boards after making drawings. All edges are just hand sanded. Parallax mid-sized Arlo, m-Arlo - learning to make accurate turns. Programmed to Beep, turn 90 CW, Beep, turn 180 CCW, Beep, and turn 360 CW, Beep - all at a very controlled speed. This is all in C - BlocklyProp is not able to take advantage of all the DHB-10 features yet. What a lovely mArlo, Thomas! Spent some time troubleshooting an IR Remote issue with Parallax. Parallax customer/technical support is SECOND TO NONE! I like your clear photos and documentation, Whit. Have you considered writing an article on mini Arlo and letting your project bear fruit and multiply? SERVO magazine needs authors, possibly MAKE too. PM me for details. BTW, does your mini Arlo burp like this one? Easy peasy - m-Arlo will be burping in now time. 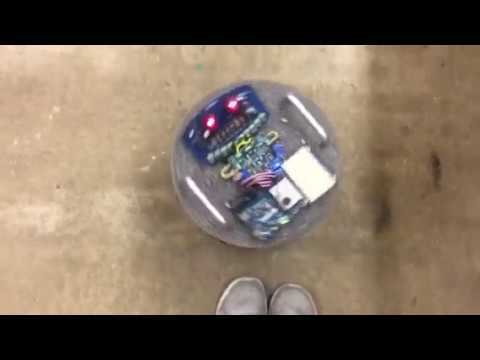 See http://learn.parallax.com/tutorials/robot/activitybot/remote-control-rock-talk-and-roll-activitybot on learn.parallax.com - This ActivityBot sounds just like Stephanie! What tool did you use to cut out your cutting boards? 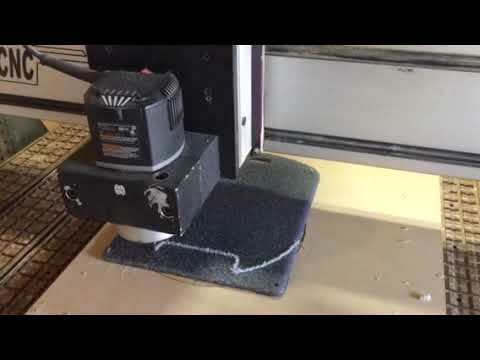 @RS_Jim - The prototype I made to try everything out was cut using a bandsaw - I drilled a center hole, made a pivot and spun the board to make the circles - then cut the wheel notches on the middle platform, the bottom is just a rectangle. Once I had everything figured out - I used a CNC router to cut the final boards after making drawings on AutoCAD. My sister teaches at Louisiana Tech and has access to some very sophisticated tools! Below is a video of the mid-deck being cut. All edges are just hand sanded to smooth them and slightly round the edges. You have inspired me to make a TArlo(T for Tiny)! @AwesomeCronk - Can't wait to see TArlo! In that case, two questions. 1. What is the diameter of MArlo? Or, I could use 3-inch wheels and CR servos. m-Arlo is 11-3/4" in diameter. I think using the ActivityBot 360 servos and wheels would make a great t-Arlo, especially since the 360 servos include the encoder function with on extra wire. You could use a Propeller Activity Board WX too. The diameter of t-Arlo would be about 6" - I may make one too! This is a super idea. You could make the whole thing for around $150. I was looking at the original CR servos, but 360s would be much better. I am on a shoestring budget, here, so I was actually looking at double wall cardboard. If I put the servos back-to-back, I could make this thing as small as 5 to 6 inches diameter. @AwesomeCronk - Cool - I totally understand being on a budget! Have fun and keep us posted.